Indian Affair in the City is the offshoot of Indian Affair Restaurant in Phillip. They originally tried an Indian-Italian fusion menu, which was not particularly popular with Canberra customers. Personally, I think the traditional Indian cuisine works much better - as evidenced by the $10 lunch I tried there! On this occasion, I ordered the butter chicken, which came in a takeaway container. 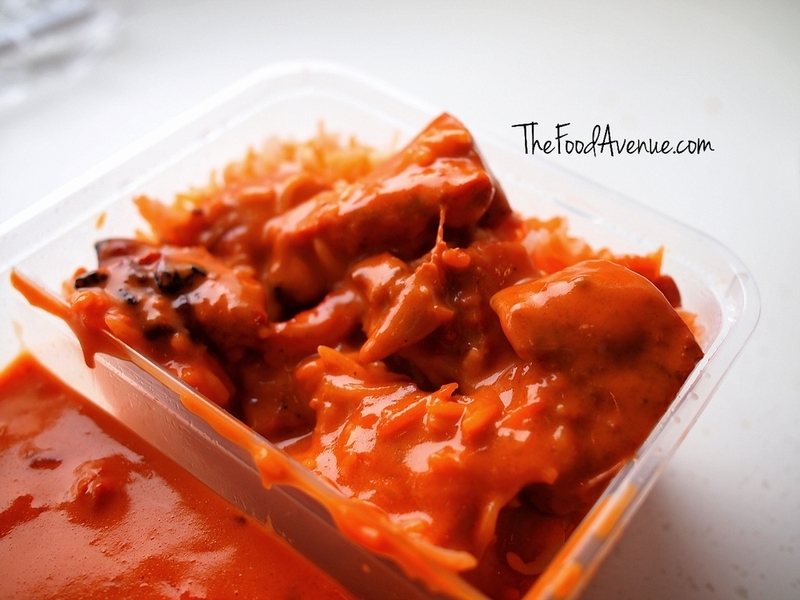 This butter chicken can be described with one word. Luscious. I had a hallelujah moment and closed my eyes in bliss after my first mouthful. There was a generous amount of chicken, which was tender and smoky in flavour from the tandoor. As I'm a bit of a chilli wuss, I ordered the mild version and there was absolutely no heat whatsoever. I think I might be game enough to level up to medium hot next time. In terms of the rice to curry ratio, it was perfect. I absolutely hate when it's mostly rice and the meal becomes bland and dry. I like my sauce. I'm a saucy kinda girl. This was an incredibly satisfying meal for a cheap lunch, especially on a dreary winter day. The $10 lunch menu (available Wed - Fri, 12pm-2pm) includes Butter Chicken and Korma, Madras or Vindaloo with chicken, beef or lamb. Basic naan bread is an extra $2.50 each (more for flavoured naan breads). Woolworths sushi. It's amazing I tell you. For the skeptics, it's actually a franchise store called Sushi Izu and they've partnered with Woolworths to set up sushi bars in Woolworths stores across Australia. You choose your sushi and take it to the cash register as though it were any other item in the supermarket. Woolworths sushi is surprisingly innovative and is providing creative and exciting alternatives to the boring stock-standard sushi options in Canberra. I love their selection. My ultimate favourite is the Crunchy Cooked Tuna Roll. The roll contains a cooked tuna and mayo mixture along with some avocado and cucumber. The best part is the crunchy topping. I can't get enough of the topping!!! The Salmon Onion Roll comes a close second. I love the combination of flavours in this one. The roll is topped with grilled salmon (deliciously smokey!) and very thinly sliced onion. Inside the roll is a creamy salad filling. The whole roll is then finished off with a drizzle of thick soy sauce, a creamy ranch-like dressing, a sprinkle of fish roe and spring onion garnish. It's a fantastic complex mix of fresh flavours that just works. I also tried the Crunchy Tempura Prawn Roll which was nice but the crunchy topping wasn't as crispy as the topping for the tuna roll. I'm loving the price of the sushi. On the surface, it seems like you're paying more than at your regular sushi place. But that's like comparing apples and oranges. I'm all about the value for money - for the price of 3 boring hand rolls, I could get a plate of exciting "fusion style sushi"! While I realise that installing a sushi bar in Woolworths may mean that the nearby local small businesses may suffer, I also believe in healthy competition. Too many times, I've bought sushi rolls where the filling stopped about halfway and the "hidden end" of the roll was just rice and seaweed. I have never once felt cheated after buying the sushi plates from Woolworths. Smaller sushi retailers may need to lift their game if they want to keep their customers. I'm also really looking forward to seeing the offerings from Hero Sushi, set to open in the Canberra Centre. Banh mi is out, delicious and complex sushi is most definitely in! Has anyone else tried the Woolworths sushi? How do you think it compares? As you may know, I'm always on the lookout for saigon rolls (banh mi) and I discovered a small bakery in Mawson that sells them (thank goodness the signage caught my eye)! The ingredients are fresh and I love the pickling of the carrot. They're generous with the condiments (pate and mayo), which means the roll isn't dry. Hooray! The chilli is uber hot though, so I'd watch out for that if you can't handle your chilli! All in all, a definite winner in my books! It seems like saigon rolls are everywhere, if you know where to look! Colleagues of mine love going to iPho, a Vietnamese place in Garema Place for lunch. After huge reviews of the crispy skin chicken (nicknamed "CSC" for short), I decided I had to try out the CSC for myself. I wasn't disappointed - as you can see from the photo. The dish definitely lived up to its name! But this post isn't about the CSC, it's about my discovery of saigon rolls in civic! While I was getting my CSC, I discovered that they had started selling saigon rolls (banh mi)! At $8 each, it costs a bit more than at Saigon Fresh in Gungahlin, but I've been waiting waaay too long for them to open a more easily accessible store in civic. So I had to go back the following day and test it out.